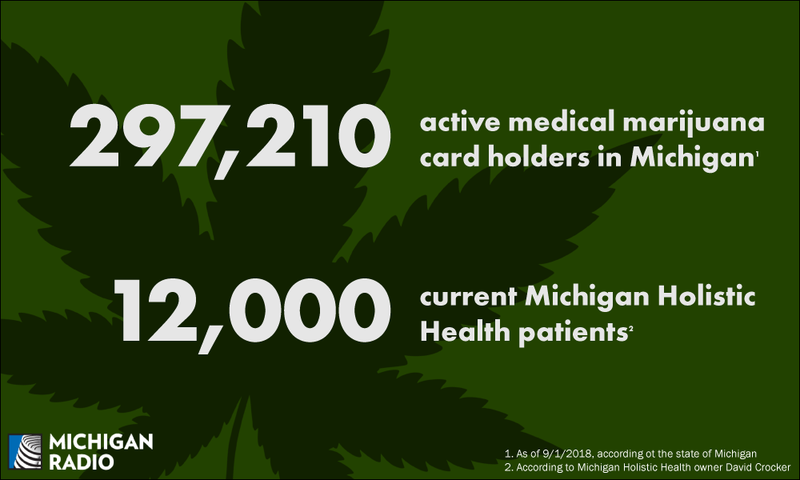 When Michigan residents apply for a medical marijuana card, they need a doctor’s certification. At his clinic, Dr. David Crocker has signed off on thousands of applications. He also sits on a state medical marijuana panel. Sometimes Michigan’s state government relies on experts from the private sector to help guide public policy. But what if the experts stand to profit from the advice they’re giving? Take for example the panel that recommends which medical conditions allow people to qualify for medical marijuana cards. Before the state approves a medical marijuana card, a doctor has to certify that the patient has a qualifying health condition. When the state considers new qualifying conditions, the Michigan Medical Marihuana Review Panel makes recommendations for or against them. Dr. David Crocker has served on that panel since 2012. Crocker is a radiologist by training and says he also practiced pain management and palliative care for over a decade. Crocker and his wife, Annette Crocker, who’s a registered nurse, moved to Michigan and opened a clinic just after the state's medical marijuana law went into effect in 2008. “I feel like I’ve kind of taken a dual role here somewhat as a business person secondarily, but primarily [as] kind of an activist for the medical marijuana movement,” Crocker says. Some doctors can’t sign off on medical marijuana applications. For example, V.A. doctors can't because marijuana is banned under federal law. Other just don’t want to get involved. That’s where clinics like Crocker’s come in. Crocker doesn’t diagnose conditions. He reviews patients’ medical records from other doctors. If a patient has a qualifying condition, he signs off on the application. This year the panel recommended 11 new qualifying conditions, which the Department of Licensing and Regulatory Affairs approved. Those conditions include arthritis, autism, colitis, and obsessive-compulsive disorder. Crocker voted to approve all of them. He also voted yes on others that failed. More approved conditions mean more potential patients for Crocker, but he says it hasn’t played out that way. Crocker’s LinkedIn page says his clinic saw 40,000 patients in its first seven years in business. Based on Crocker’s numbers for his current patients, his practice would account for approximately 4% of all of the active medical marijuana cardholders in the state. “It may sound like a lot, but if you look at a regular primary care specialty clinic that sees a lot of patients, same patients over and over again, it’s not that out of range,” he says. Dr. Daniel Berland, a professor and physician at the University of Michigan, thinks it's fine for doctors to sit on a state advisory panel and certify patients' medical marijuana applications, up to a point. "When it turns into hundreds of cards, that feels like a conflict of interest. That feels dirty," he says. Berland’s medical practice at U of M includes pain management and addiction treatment. We showed him the numbers Crocker has used to describe his workload. Berland says having that many patients raises questions about the line between treatment and profiteering. Berland is skeptical about marijuana’s power to treat such a wide range of conditions, and notes that clinical research on the subject is thin. He also says Crocker lacks the kind of specialty training a doctor should have to make the recommendations the review panel is required to make. Andrew Brisbo disagrees. He’s the director of the Bureau of Medical Marihuana Regulation, which oversees the panel. Brisbo believes having a physician like Crocker as a member is a benefit. Crocker and his wife now run four clinics in Southwest Michigan. They’ve also added two other doctors. Here’s the basic business model: A first-time exam costs $200. A renewal exam is $150. Again, Crocker estimates the practice has done as many as 80,000 exams. In an interview for this story, Crocker answered questions about the finances of his business. DOUG TRIBOU: If you average those two fees, that’s something like $14 million in fees. That seems like a pretty big significant number, on one product, to an outsider, I guess. DAVID CROCKER: Yeah, no. It’s a big number. It’s not accurate, but it’s a big number. DT: Well, what’s not accurate about it? DC: Well, number one, remember that patients renew their cards every two years now and it’s been that way for a while. The numbers you threw out there would be misleading at best, I would say, in terms of how much we brought in, but we’re not starving. Crocker says he currently makes less than $200,000 a year. David and Annette Crocker run medical marijuana card clinics in Michigan and Florida with nearly identical websites for both states. When it comes to customers hearing about his clinics, Crocker acknowledges that being on the state panel doesn’t hurt. “It builds trust, right, when you have someone that’s involved deeply in a subject,” he says. But after several years in his unpaid position on the panel, he’d rather be done. If Michigan voters approve the ballot measure to legalize recreational marijuana in November, Crocker believes his business will eventually become obsolete. As an activist, he says he would welcome that. But Crocker wouldn’t be out of options. He and his wife also own another medical marijuana card clinic – operating on the same business model – in Florida. Lauren Talley and Maya Goldman contributed to this story. It was edited by Sarah Hulett.